What’s The Best Interactive Dog Toy That Is Safe And Fun? Do you ever get tired of telling your dog “ Stop, I can’t play right now!” or “I’m sorry, I have to go to work, we’ll play later.”? Poor puppies, all they want to do is have a little fun! Some dogs require more play time than others and if you happen to own a pet like that, you know it can be trying at times to keep them happy and content. It can make you feel really bad for them too if you do work away from home and they are left alone for hours on end. When you have a puppy or an adult dog that is high strung or just likes to stay busy doing something, it’s an excellent idea to invest in dogs toys that will interact with your pet. Some can require a little help on your part while some of the other toys can keep your dog challenged and entertained without assistance from you. You may wonder why it is that your particular dog needs all of that mental and physical stimulation. According to Dr. Brian Hare, associate professor of evolutionary anthropology at Duke University, the way a dog thinks translates into the way a dog acts. Meeting their mental and emotional needs is as important as meeting their physical needs. Dr. Hare also believes that as dogs age, their cognitive abilities can decline. Things such as sleeping more, short term memory problems and even bonding with their owner can become issues. Interaction can help keep a dogs mind sharp over the years! Certain dog breeds can also be a factor in how much attention they need. Jack Russells, Border Collies, Poodles and Chihuahuas are examples of just a few breeds that may require more attention and be more prone to hyperactivity. However, almost any breed of puppy or younger dog can be so full of life and energy that they seem to want to be on the move all of the time or sometimes act out to get attention. Even though you want the very best for your dog, you may not have all the time available that enables you to give them that attention they crave. Once again, this is where certain toys that can actually interact with your dog when you can’t will be a valuable asset for them and for you. According to Clicker Training.com, not enough exercise and not enough mental stimulation are two of the leading factors in dog misbehavior. When a dog’s mind and body are active, it will eventually tire them out. Providing enough stimulation to achieve tiredness can be a key to a more settled and well behaved dog. Just a few things your dog may resort to when it wants stimulation or exercise is chewing up things, excessive barking or constantly seeking your attention. They may whine and bark a lot when you leave them home alone. They may urinate and poop where they should not. While good training is also required to help prevent these bad behaviors, having some interesting favorite toys that challenge the dog can go along way in helping entertain your pet and keep him happy. Which Interactive Toys Are Best For Your Dog? When most dog owners think of how intelligent their pet is, they are proud when they learn to sit, fetch, roll over or chase a ball, but you probably think anything technological is beyond their comprehension. Not so! The Clever Pet Hub is a simple, yet complex learning and feeding toy that actually challenges your dog to learn more! The Clever Pet Hub is a digital feeder that sits on the floor. It has lights and speakers and works using wi-fi. In order to get the treats that the hub dispenses, the dog must learn to pay close attention to the sequence of lights and sounds. They must learn to respond to left or right as directed. You might think that once the dog figures out the pattern, they will lose interest and become bored, but the clever thing about the Clever Pet Hub is that the game challenges change and update automatically as your dog learns! The skill set gets a littler harder as time goes by. Your dog pays attention closely once he discovers that his reward is a treat he wants really bad! New games can also be downloaded. The Clever Pet Hub is among the priciest of the new dog gadgets, but many dog owners think it is well worth the cost. The unit can be purchased for around $350, more or less depending on where you buy. The hub can keep your pet entertained while you are away from home and can be enjoyed with your dog when you are there. Click Here To See More About The Tether Tug! Almost all dogs love to play the tug of war game. 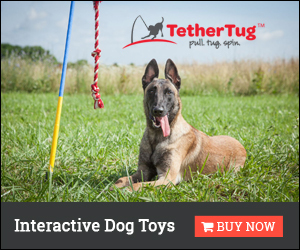 Tether Tug is designed to allow your dog to enjoy this game outside without you needing to hold the other end! The Tether Tug has an in ground base that holds the flexible pole firmly in place while your dog tugs, pulls and fights to get the rope toy free! It is an excellent choice for any dog that needs some exercise or just needs to burn off all of that pent up energy! There are different toys that can be easily changed out to prevent your dog from becoming bored with any one particular toy. Tether Tug Large is great for bigger dogs that are really strong pullers. Prices start about $30 and up. If you are looking for a great plush fetch toy that provides just a little bit more entertainment, then this is the one. The Ballistic Hide ‘N Treat has velcro pockets where treats can be hidden. Getting the treats out is fun and challenging for your pet. The great thing is they can enjoy it without your interaction. Just put in the treats and watch your dog entertain himself! For a $10 buck or so investment, your dog will have hours of fun with this one! Tennis Pals by Kong provides the best of two playthings, the tennis ball and a squeaker in one. Place the tennis ball inside the rubber squeaker and watch your dog go crazy trying to get it out! You can use the ball separately for a game of catch or place it inside the squeaker to throw and fetch. An inexpensive interactive toy that is a great buy either way you use it! It comes in different colors and designs for around $10 bucks or less! Made of durable material, the Kong Stuff-A-Ball can be filled with treats. When rolled around, the treats will come out. If you use smaller treats, they come out easier. Use treats of a little larger size and it takes a little longer to get them out. Since this in an inexpensive toy, it is worth the money to provide your dog with a little extra work to get his rewards! This is literally a puzzle game! The board to the Nina Ottoson DogFinder game holds little plastic cups that you can hide treats underneath. It is a good way to play and interact with your dog to teach him or her to look for the hidden treasure! If your dog loves to hide a treat and then go back and dig it out, the Wooly Snuffle Mat cute mat could really be a good investment. It is handwoven from a durable fabric with hand stitching. It is also machine washable! Just put in small treats or kibble and watch your pooch try and sniff and scratch it all out!. It encourages their natural instinct to forage for their food! It is a little pricey at about $40 dollars, but since it is so well made, it’s probably worth it if foraging is an activity your dog enjoys. This is Mini Solitaire game is a puzzle board where you hide the little treats or kibble underneath the round blocks. Put a treat under each block or just under a few. The round blocks have holes in the center that allows your dog to sniff them out. Fun treat finding game that requires you to set it up and then let them forage away! This set is designed for beginners and smaller dogs or puppies. At around $20 dollars, it’s a safe cool game that’s very affordable. The Trixie Poker Box is a little different, although it is a puzzle game of sorts. The boxes each have a different method for getting inside then and getting the treat. It can be a little more challenging than simply hiding a treat under a block! It comes in different styles. This game is intended for dogs that have tried other similar games and mastered them. If your dog is naturally smart, it could be just the right thing! Prices start at around $22 bucks. This tray game is for more advanced players! It has a knob that must be moved to open one drawer to get a treat. It has sliders that can be moved with the paw or the nose. One drawer has a pull string to get it open. Your dog will have to use some concentration to master this activity tray! Priced very nice at around $15 dollars or less! This floor game puts an interesting spin, literally, on finding the treat and getting it out! The stand up design has 3 beakers that can be spun in order to make the treat fall out. It has two set of lids with different patterns to give the game even more variety and challenge. It is best for dogs that have already been introduced to these types of puzzle games. The price is very affordable at around $23 dollars. This puzzle tray is the beginner level for dogs to learn to how to get the treat out of the compartments. Pull string drawers is method of play and a top knob box is another. It’s a great way to introduce a dog to tricky games and fun for puppies as well to get them started learning! Priced at near $23 dollars it’s a great teaching tool as well as entertaining. If your pooch loves plush toys, then this little chirping chick will make them mad with excitement. It sounds life like and gives a little more animation to a plain old stuffed toy! For about $6 bucks, you can’t go wrong with this toy! This is a ball that does more than bounce! The talking Babble Ball is motion sensitive and can provide some cute comments for your pup or make adorable animal sounds they will love. A great choice to add a little more flare to the plain old ball! Durably constructed and has replaceable batteries. Cost is about $6 bucks. This furry little tree stump comes with furry little squirrels to be hidden and found! It comes with 3 squirrels that squeak when bitten and chewed. Your dog can dig the squirrels out and then they squeak them all they want! Fun for plush toy and squeaker lovers for about $17 dollars. Larger size with 6 squirrels available.